This is a chain that is found in the Houston area. They always start out each meal with some freshly baked bread, and this delightful garlic butter. 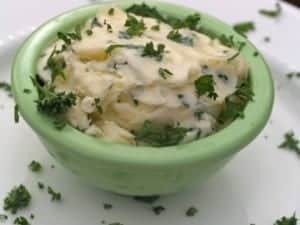 You can make compound butters at home, they are easy to make. You can use this with bread, or on a steak, or even steamed vegetables. Enjoy the garlic butter the Original Pasta Company would serve with their Italian bread. Allow the garlic butter to reach room temperature. Peel six cloves of garlic and chop fine. Stir garlic cloves and parsley into the softened butter. You can place the butter into a mold if you like. Transfer this into a small container, and keep this refrigerated. This keeps up to a month. I wonder how this would taste with roasted garlic. I am sure it would be very tasty.